The global surgical drainage devices market has been envisaged to witness the rise of acquisitions and new product developments. According to a report penned by the analysts at Transparency Market Research (TMR), NeuWave Medical, Inc. was acquired by Ethicon, Inc. in 2016. In the same year, a newfangled dressing kit was launched by Medela AG as part of its independent negative pressure wound therapy (NPWT) strategy. A largely consolidated character has been prognosticated to be owned by the world surgical drainage devices market with top five companies constituting more than a 65.0% share in 2015. Owing to a robust product portfolio in NPWT, Acelity L.P. Inc. had secured an over 20.0% dominant share in the same year. 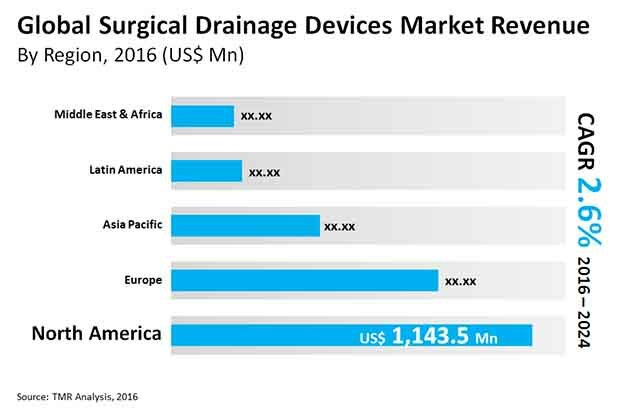 As per the statistics procured by TMR, the world surgical drainage devices market has been prophesied to be valued at US$3.5 bn by the end of 2024 from US$2.8 bn in 2016 while growing at a 2.6% CAGR. By application, orthopedics could rise at a higher CAGR of 3.6% in the world surgical drainage devices market on account of the need to conduct orthopedic surgery for musculoskeletal conditions. Early adoption of treatment, technological advancement, and surging aging population have been envisioned to help North America gain around a 40.0% superior share in the world surgical drainage devices market by 2024. The international surgical drainage devices market has been foretold to invite lucrative opportunities due to a weighty demand for surgical procedures across the globe. The increasing count of surgical treatments could be attributed to the growing population of aged people likely to suffer from different kinds of chronic infections and diseases and elevating incidences of sports injuries and road accidents. Unhealthy lifestyle may be a major cause of chronic disorders such as cardiovascular and vascular diseases such as neurovascular. As a result, the upsurge in the adoption of surgical procedures has been predicted to drive growth in the international surgical drainage devices market. In addition to the above driving factors, the international surgical drainage devices market could be advantaged by the providence of healthcare insurance coverage and mushrooming healthcare awareness among both general population and physicians. Vendors operating in the international surgical drainage devices market have been anticipated to rake in handsome profits on the back of a growing number of minimally invasive procedures increasing the demand. The worldwide surgical drainage devices market has been expected to be hindered by significant product recalls on its growth path. Dearth of clinical expertise and knowledge has also been expected to delay the growth of the worldwide surgical drainage devices market. However, there are some bankable opportunities available in the worldwide surgical drainage devices market for participants to make profits in the face of the aforementioned challenges. Inflating size of the disposable incomes of consumers could escalate the uptake of high-cost treatments, which could be a crucial factor boosting the growth of the worldwide surgical drainage devices market. The demand in the worldwide surgical drainage devices market has been foreseen to be stimulated by the swelling engagement of the devices and perpetual advancements in technology for products such as active drainage catheter. Numerous acquisitions encouraging consolidation could birth new prospects in the worldwide surgical drainage devices market.